Come and see one of the most beautiful places in Masuria. Rudziewicz Inn Piękna Góra is located at the foot of the mountain called Piękna Góra, from where you can admire the amazing view of Gołdap’s panorama, Romincka Forest and the Szeskie Heights. The hotel has 60 beds, a restaurant with a drinks bar and a conference room. The rooms we offer are very well furnished (among others, they all have satellite TV and internet access), and we have professional staff who will ensure you have a good time during your stay. The interiors were designed in the style of a hunter’s lodge and offer a unique aesthetic experience. In winter, enthusiasts of winter sports can enjoy well-maintained and illuminated skiing trails equipped with t-bar and chair lifts, a ski piste and an alpine slide. Fans of swimming can take advantage of the water reservoir located in a picturesque area at the foot of the mountain. Rudziewicz Inn is a world centre for cepelinai lovers. Each year there is a cepelinai-eating contest. Except for the cepelinai, we also offer game and fish dishes. Our guests have the option of selecting a fish from among those swimming in the restaurant’s fish tank and have it prepared according to their wishes by the chef. An additional tourist attraction we organise for our guests is the Bloodless Safari. At the eco farm run by the Rudziewicz family, groups of wild animals are kept (deer, fallow deer, goats, mouflon sheep, Scottish cows as well as exotic birds). We also offer outdoor parties including such entertainment as smoking and frying fish as well as our own game meats. Our clients can also opt for angling and camping at the pond, in the wild. Here, each season shows a lovely face. In Gołdap, everyone knows them and in the province, the name Rudziewicz is also well-known to many. In some circles, their opinions are considered expert. They know everything there is to know about deer. The Rudziewicz family is full of passion and the will to act while looking into the future. The Rudziewicz estate has: 1000 fallow deer females, 500 roe deer females, and 50 Manchurian sika deer females, red deer (the first such group in Europe), yaks, mouflons, wild Przewalski’s horses, Tarpans, wild boars and wild and domestic pig hybrids. Herons, cranes, cormorants and more and more frequently even white-tailed eagles soar over our heads. On the island, Ms Ania, the sorceress of Zatyki, is hostess to the most distinguished guests from all over the world. She hosts politicians, actors, sportsmen and recently has hosted the most beautiful women in the world. She prepares fish fried over a bonfire, Babulinki, fresh meats, and steaks. Her eco farm can be a model for others. She has many passions, and one of them is domestic birds – her guinea hens, hens, and peacocks are just some of the jewels in her collection. with good snow conditions, the 1150 m skiing trail next to Rudziewicz Inn is also available. 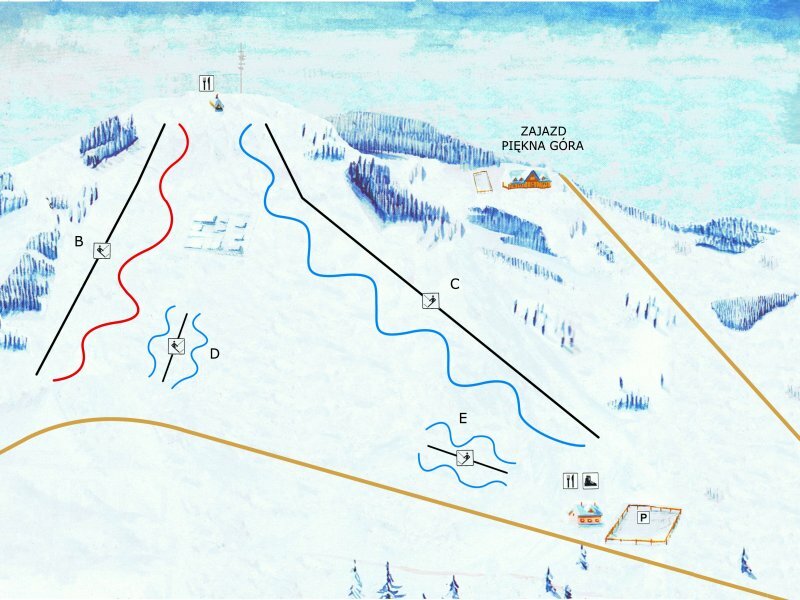 Over 2000 m of skiing trails of various difficulty, for beginners and advanced skiers alike. Illuminated skiing trails, additionally maintained using snow machines and snow tractors. 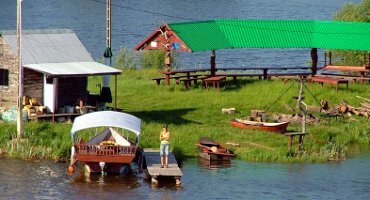 Rudziewicz Inn also includes a restaurant, which offers fresh fish from the ponds and lakes nearby… as well as from reservoirs a few kilometres away. We also serve cepelinai, game, with a smile and fully professional service. We hope Rudziewicz Inn will be as famous as our other ventures.